Wilson County (809 sq miles) is in the liquids-rich Eagle Ford Shale Play of South Texas. Generally, drilling activity targets the oil window of the Eagle Ford in the southeastern half of the county where well economics are enhanced by the production of oil. The formation is found at depths between 4,000 ft and 8,000 ft as you move southeast through the county. The deeper portions of the county are considered more prospective as the formation is also thicker in this area of the play. 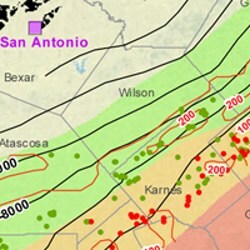 The county's oil and gas production previously exploited the Austin Chalk and conventional formations, but recent activity has shifted to the Eagle Ford Shale Oil Play. County services of interest to oil and gas lease owners include the Wilson County Appraisal District (tax collector) office and the Wilson County Clerk (property records) office. The county is approximately 35 miles southeast of San Antonio, TX, and the county seat is the town of Floresville. Other towns in Wilson County include Carpenter, La Vernia, Nixon, Pandora, Poth, Saspamco, Stockdale, Sutherland Springs, Grass Pond Colony, Kicaster, Doseido Colony, and Sandy Hills. Join the Wilson County Discussion Group today - your voice counts! EOG Resources and Marathon Oil are the largest producers with operations targeting the Eagle Ford Shale Oil Play. EOG Resources' well results are very positive as the company has reported IPs at its Borgfeld #3H and Casares #1H leases averaged initial production rates (IP rates) in excess of 800 bbls/d and almost 400 mcfd. Marathon Oil also has a considerable operated acreage position in the county. In June of 2011, the company complemented this acreage through a $3.5 billion acquisition of Hilcorp Resources Eagle Ford assets in Atascosa, Gonzales, and Karnes counties'. This following information is provided by The University of Texas at San Antonio’s (UTSA) Institute for Economic Development.